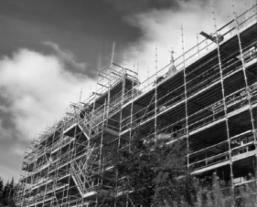 Repair and Restoration (Rawcliffe Lodge). Page 5. Rawcliffe Lodge built in 1862 by Scottish architect John Burnet (an accomplished Gothic designer, most notably at Woodlands Church, Glasgow and the Glasgow Stock Exchange) for textile merchant Alexander Bannatyne Stewart. 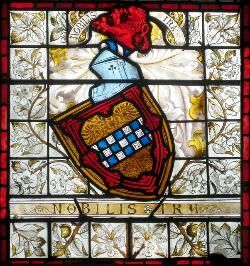 Stewart Coat of Arms stained glass. Minor repair, cleaning and safety glazing for this hall landing window. Glasgow. 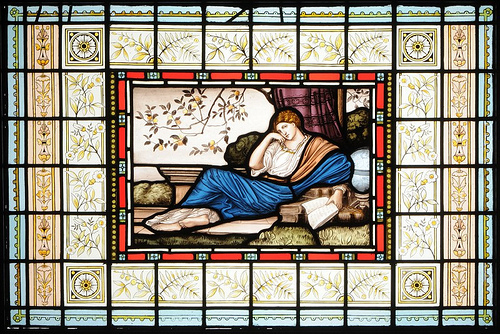 Stained glass originally made by Glasgow stained glass firm W & J.J Kier c1870. Established by David Kier in 1802-64, known primarily for the installation of the controversial Munich stained glass windows by the Royal Bavarian Manufactury for Glasgow Cathedral in 1856. 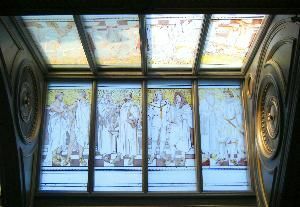 The gallery stained glass windows depict historical figures including Scopas, Praxiteles, Ghiberti, Donatello, Veronese, Titian, Sir Christopher Wren and Inigo Jones. The windows are approximately 2.5m in length and are probably amongst the largest single panels of stained glass windows in Scotland.(?). The gallery has been converted into the main living area for a new flat. The roof of the gallery is in three sections of 8 windows each. Details of 3 the 24 gallery stained glass windows. 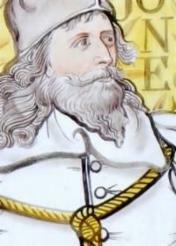 Inigo Jones, Architect, (1573-1653). Cimabue, (1240–1302) was an Italian painter and creator of mosaics from Florence. Giotto, (1266-1337) was an Italian painter and architect from Florence in the late Middle Ages. He is generally considered the first in a line of great artists who contributed to the Italian Renaissance. 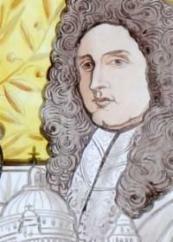 Sir Christopher Wren, Architect (1673-1723). 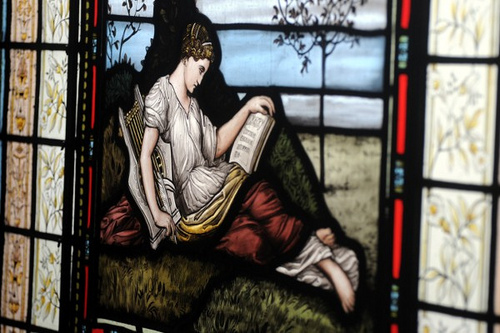 Repairs were carried out on most of the 80 stained glass windows in the house ranging from cosmetic lead repairs over small cracks to full re-leading, painted sections and complete reproductions. The main central theme of some of the windows had been stolen/removed and had to be re-painted. 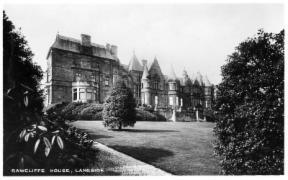 The house had been used as a Carmelite Convent for 100 years before lying empty for 5-6 years. There was also a Heath Robinson looking holy water making machine in the basement! New wooden frames were designed for a set of 8 "virtue" panels to allow double glazed units to be fitted. 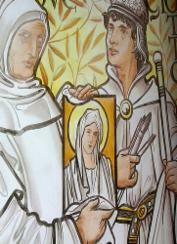 Rather than putting the stained glass inside the double glazing, the panels were fitted in front of them. Double glazing is only gauranteed for 10 years or so, a stained glass panel should last at least 150 years before some work may need done on the lead.